Disney Interactive has announced a new mobile game, “Where’s My Mickey?” The game builds on the success of “Where’s My Water?” and will use the same style of physics-puzzler gameplay but this time based around popular characters such as Mickey Mouse, Donald Duck and Goofy. The game has launched on Android and iOS with over a hundred different levels available. Three episodes come with the game and two more are available for purchase. 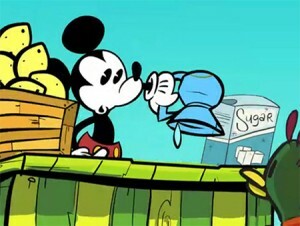 Each episode is themed around a story involving Mickey and his friends attempting to get water. For instance, in the episode “If Life Gives You Lemons” Mickey is running a lemonade stand and you have to pursue water across 20 levels. Other episodes include “Fanning The Flames” and “Growing Pains”. The development team is already working on more downloads for the games which will become available over the coming months. The puzzles themselves have progressed since “Where’s My Water?” There are now clouds which carry water, wind to blow the clouds and plants as well. Overall it is a great game which looks sure to provide hours of entertainment.